I watched most of Game 5 of the NLCS in a noisy bar, but it wasn’t the same experience I usually have while watching a game in public. Instead of glancing at the screen every now and then just to check the score while drinking and chatting, I found myself much more concerned with what was happening in the game than usual, not because I was transfixed by the contest itself, but because I didn’t want to miss anything Cubs second baseman Javier Baez did. I’ve had some trouble figuring out what exactly it is about Baez that has me so hypnotized whenever the Cubs are on TV. He can field and hit, but so can lots of players in MLB, and it feels weird to say that a guy who was a super-utility player a few months ago is my favorite player in baseball rather than, say, Mike Trout. And yet, here we are. The best example of what makes Baez so special is his tagging. In September, baseball fans started noticing the ways in which Baez went about tagging runners (FanGraphs has a great timeline of the phenomenon), and he officially became known as an elite tagger. That still feels like a weird way to describe a baseball player, and that’s because nobody before Baez had ever made the simple act of tagging a runner an action worth noticing. So how does a player turn something as mundane as tagging into a highlight? Baez does it with an uncanny combination of field awareness, quickness, and coordination. This combination shows up in just about everything he does on a baseball field, and that’s precisely what makes him so captivating. When you have an infielder with a lightweight boxer’s hands, an NBA point guard’s first step, and the highest baseball IQ on the field, everything he does is going to look cool. There are canny athletes who can awe you with their ability to control the game, and then there are guys who can grab your eyeballs with their physical gifts. It’s rare to encounter a player who can consistently do both, but that’s exactly what Baez has been doing throughout the playoffs. His highlight reel includes plays that look like physical impossibilities, crafty and ballsy base running, split-second strokes of defensive genius, and plenty of swings designed to deliver prodigious dingers to the adoring public. 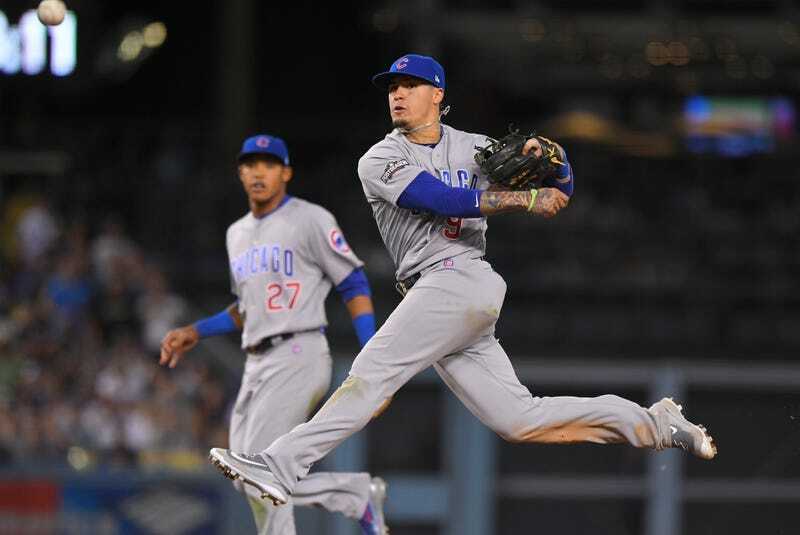 Watching Javier Baez play baseball is like watching Tim Duncan lock down his man with a bit of masterful post defense on one end of the court and then throw down a Russell Westbrook-style dunk on the other end. It’s like watching Mark Buehrle pitch if Mark Buehrle also had a 94-mph fastball. It’s like watching David Eckstein hustle for the extra base and then hit a 450-foot donger in his next at-bat. It’s impossible to not watch.